Play with this sweet, soft puppy figure and she'll play with you! And how will you know when she's as happy as may be? Your Bouncy My Happy-to-See-Me figure will often be puppy-cute, and she'll usually be excited as can be when you come around! Put your new little friend on the ground and she'll jump and spin when you're close! When you pick her up and pet her, she'll make happy puppy sounds — just like a real puppy! 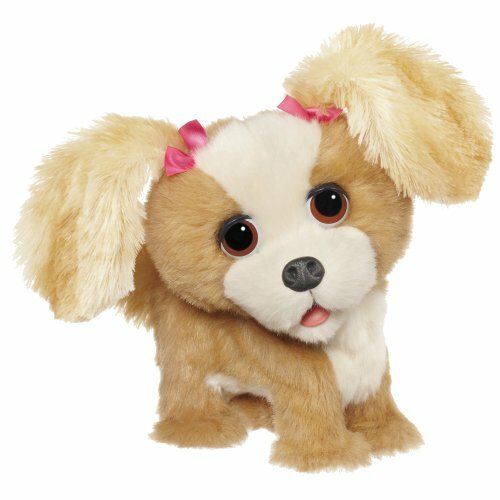 This Bouncy My Happy-To-See-Me Pup pet from Furreal Friends loves to show you how happy she is. Using light-sensor technology, your Furreal Friends puppy can tell when you are near her, and she will respond to you. With a simple wave of your hand or a gentle pet on her head, she'll playfully jump in circles, and bark with excitement like a real puppy! 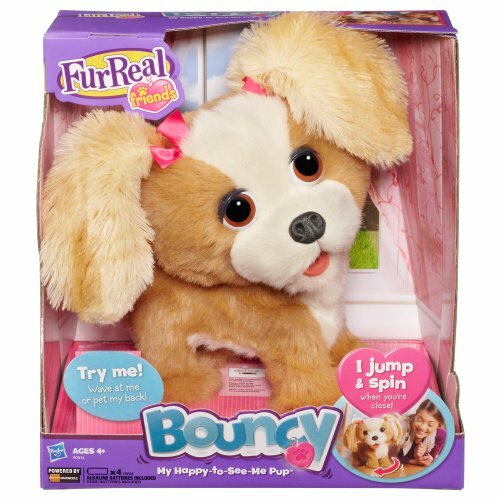 The Bouncy My Happy-To-See-Me Pup toy from Furreal Friends responds to you like a actual puppy might! Your Very Best Friend Just wave your hand near her face, or touch the special sensors on her head, and she will bounce with joy, bark, and turn in a circle. When you pet your happy, small pup on her back, she will make sweet and loving puppy sounds to show you how much she loves you. 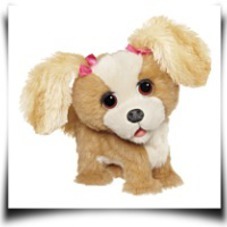 Imagine the joy you'll feel when greeted by your best friend: a sweet bouncing plush puppy! For calm snuggle time, just pet this soft, plush pooch on her back, and she'll respond with sweet and loving puppy sounds. What's inside the Box When you wave your hand in front of her face, or pet her head, your Furreal Friends Bouncy My Happy-To-See-Me Pup toy will jump in circles and bark with excitement. Product Dim. : Height: 10.98" Length: 7.99" Depth: 12.01"
Package Dim. : Height: 7.9" Length: 11.7" Depth: 11.5"